When talking about interior design trends, it can sometimes be difficult to envision how to transform a long list of features into a finished space. Especially when trends are very specific (or even contradictory! ), you might find yourself struggling to make all those tips and trends work for your space. That’s why today I want to take a look at six small bathrooms that lean hard into some of the top 2019 bathroom trends and do a beautiful job combining them into something cohesive and similar-feeling but distinct. There’s no one set combination of elements that make up a “perfect” bathroom; even if you follow trends very closely, there’s a lot of mixing and matching involved in getting a look that works for you. That said, today I want to take a look at a few bathrooms that draw on the same set of trends to create what I think will be a go-to, iconic bathroom style for this year. Specifically, combining a natural wood vanity, painted shiplap walls, and graphic tile to create a bathroom or powder room with a soothing, natural ambiance and an ever-so-slightly rustic, inviting touch. I recently did a more in depth look at 2019 bathroom trends, and astute readers will notice that one of those three features – the painted shiplap – didn’t even make the main list. Why the discrepancy? Simple. 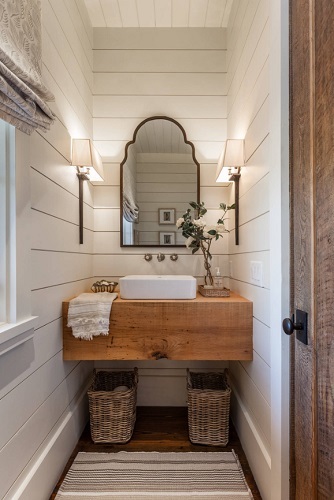 My focus for that post was on big trends for big bathrooms, but shiplap walls are much more common in (and, if you ask me, much better suited to) smaller spaces. 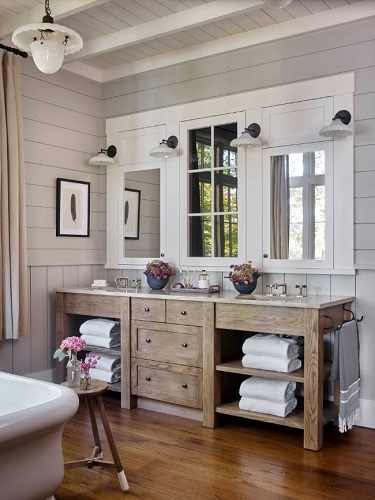 Particularly when paired with natural wood, painted shiplap has a very classic, timless feel, which makes it a great alternative to the iconic white cottage bathroom that’s dominated the design world for years. 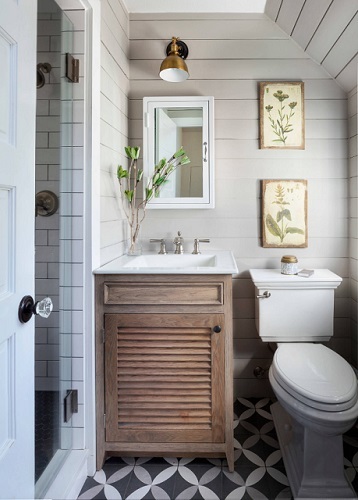 While big bathrooms have more options when moving away from white porcelain, shiplap is a rare alternative that offers added warmth even in a smaller space. And the graphic tile? Keeps the look from feeling too old fashioned by adding a bright pop of modern style. Can This Look Work In A Bigger Bathroom? The short answer? Of course. The long answer? If you do it well. 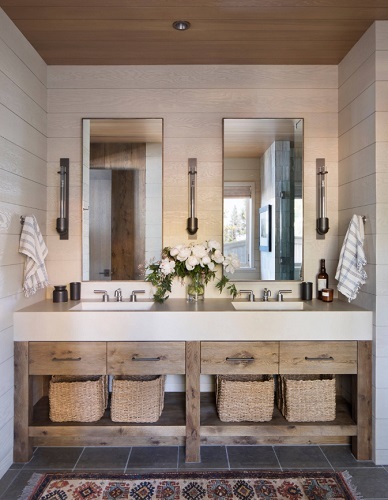 The most important thing to keep in mind when applying this look to a larger bathroom is that a little bit of shiplap can quickly start to feel like a lotta bit of shiplap, and shift from a cute textural accent to a major design choice. 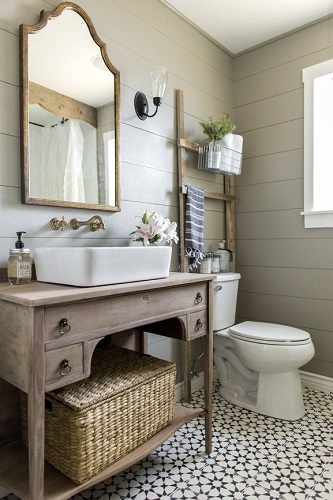 A big bathroom with wall-to-wall painted shiplap is almost certainly going to have a more rustic feel than an identical bathroom with a smaller footprint, so take some time to consider whether the look will fit with the aesthetic and architecture of the rest of your home. If you want to play up the old fashioned cottage or farmhouse feel, nix the graphic tile and opt for hardwood instead, and accentuate with vintage lighting fixtures. Wood floors will add a nice layer of literal and visual warmth to the space, and vintage lights, while old fashioned, are actually quite trendy this year and will round out your space nicely. Natural wood should be the star of your space, the knottier and more obvious the grain the better, but don’t be afraid to accentuate with other natural elements, like rattan baskets, natural fiber rugs, or even fresh flowers or live plants, to give your space a simple, earthy feel. Thus far, all the bathrooms I’ve featured here have walls made of shiplap painted in a very similar color – a warm, light, gray-beige neutral. But while this color family is overwhelmingly popular, you shouldn’t feel restricted to it. 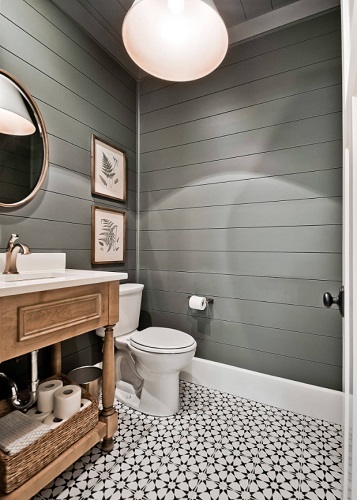 In fact, changing up the color of the shiplap is an excellent way to personalize the look, whether you opt for a darker color (like this rich gray-green) or pick up another recent trend and opt for a lightly whitewashed finish instead. The patterning on the tile you choose (and whether or not you choose to include it) can also have a big impact on the overall ambiance of the space. Like the idea of a natural, spa-like bathroom, but not overly fond of a really rustic design? For a more contemporary take on this look, think smooth. The more rough edges you have in your bathroom, the more rustic it will feel – starting with a weathered wood vanity, but including floors, frames, stone elements, and so on. Balance out more textured wood with smooth, polished surfaces (whether it’s simply finished wood or tile or a composite countertop), and opt for light fixtures that have a more industrial feel to keep the space from feeling old fashioned. Whether or not you love this particular combination of bathroom design trends, I hope that seeing a few simple elements mixed and matched in several different ways has made it easier to see how you can bring this year’s best new ideas to life in your own home! This entry was posted in Bathroom, Bathroom Lighting, Bathroom Vanities, Decorating Ideas and Tips, Latest Trends and tagged 2019 bathroom design, bathroom design, graphic tile, guest bathroom, natural bathroom, Powder Room, shiplap walls, wood bathroom, wood bathroom vanities.